No, we are not engaging in cruel and unusual chicken torture here. I just couldn’t call this bbq since I made it in a crockpot. 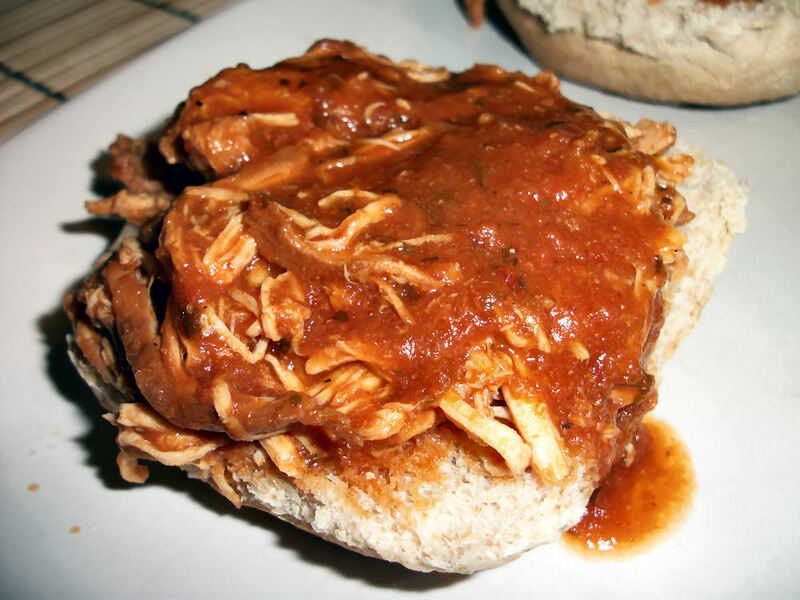 It really is a bbq pulled chicken sandwich, so very delicious. My aim here was to control more of the sauce. I would usually make the sauce using ketchup but since my beloved ketchup does contain a lot of sugar I had to investigate another way. Happily after much tweaking, I found it! I suggest serving this as an open face sandwich, it is nummy and the bread doesn’t dull the sauce as much that way. I love how using the crockpot means you can have that bbq joint style of taste no matter what the weather is like, and healthy too! This was great at the end of a really busy day too. Stir sauce, add chicken, set crock, run around all day, eat nummy food. Epic win. Combine all the ingredients except the chicken in a small bowl. Pour a layer of sauce on the bottom of the crockpot. Add the chicken and then top with the remaining sauce. Using a pair of forks shred the chicken and stir. Ladle onto bun of choice. Serves 4. Nutritional info does not include the bun. Each serving contains 183 calories, 2.8 grams of fat, 10.9 grams of carbs, 1.6 grams of fibre, and 27.6 grams of protein. Definitely a tasty plan for busy days. Remember that each serving of this also contains a serving of veggies! Pair this with a salad and you are dealing with a beautifully balanced meal for so little effort. This entry was posted in Comfort Foods, Craving Buster, Crockpot Creations, Dinner and tagged Chicken, mustard, Tomato. Bookmark the permalink. How did I miss this comment! I love a good crockpot recipe too! Especially on days that are so busy. They save us from getting the inevitable take out food that is never as healthy or budget friendly as a home cooked meal.